Both needle-point and bobbin-laces were made in Ireland before the middle of the eighteenth century, but never, apparently, on a commercial scale. The Dublin Society, a patriotic association, the avowed object of which was the encouragement of Irish arts and industries, as early as 1743 offered prizes for the best bone-lace and needle-point made in the city. Lady Arabella Denny, working in connection with the Dublin Society, did good service in introducing lace-making into the Dublin workhouses, especially among the children there, in recognition of which the freedom of the City of Dublin was conferred on her in 1765. Prizes for lace of home manufacture continued to be given by the Dublin Society, with apparently satisfactory results, up to about 1780. Yet it has disappeared as completely as if it had never existed. There is no record of any lace, either needle-point or bobbin, having been made in Ireland between 1780 or 1790 and 1820, in which year Carrickmacross appliqué, which it is customary to include among laces, was first produced. In this, the pattern is cut out of very fine cambric, applied to net and worked up with needle-point fillings. 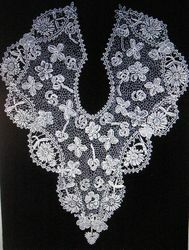 A rather later variety of this lace is Carrickmacross " guipure," in which the cambric pattern has no net ground, but is held together with needle-point brides. These laces are often very pretty when new, but as the edge of the cambric pattern is merely whipped lightly over, not buttonhole-stitched, they do not stand washing with impunity. About 1829 tambour-lace began to be made in Limerick. It was introduced from England, but whether from Manchester, where the same style of work was already being made by machinery as well as by hand, or from Coggeshall, in Essex, the original home of the industry, is a question on which opinions differ. The process of working the lace is as follows : the machine-woven net is stretched on a tambour-frame, which consists of two wooden hoops covered with strips of some soft stuff such as flannel and differing slightly in diameter. The net is spread smoothly on the smaller hoop and the larger one slipped over it, so that the net is tightly strained between the two. The pattern is sometimes sketched on the net, but as it is, as a rule, fairly simple, most workers find the drawing placed in front of them a sufficient guide. Needle-point ajours are introduced in some specimens, but often the entire work is executed with the tambour-hook. Flax thread, cotton and an untwisted shiny silk are all employed for the work. Unfortunately tambour-lace can be accurately copied by machinery, and that such imitations were to be had quite early in the nineteenth century. The handsomest and most modern Irish lace is Youghal point. This had its origin in a piece of Italian needle-point, which finding its way in 1846 to the Presentation Convent at Youghal, Co. Cork, was there carefully studied and eventually copied by the Mother Superior, who passed on the knowledge she had thus gained to the pupils of the convent school. 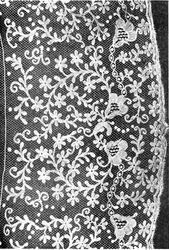 In course of time, reproductions of Venetian rose and flat-points were made at Youghal, Kenmare, New Ross, and elsewhere, but of late years Irish crochet has been the staple industry of the districts where these five laces were produced, and the output of the latter is now very small indeed.